The theme of toxic masculinity is getting a lot of (long overdue) play in the Australian cultural landscape of late. With the possible exception of those packs of lycra-clad bicycling dudes, nowhere is this societal trope more evident than in the corporate workspace. It’s this setting that Queensland dance theatre ensemble The Farm has selected for their new work, the aptly named Cockfight. But if you’re worried about being bludgeoned by some unsubtle political posturing, fear not! Cockfight is 90 minutes of hilarious absurdity, wrapped in dance. I have not heard a dance audience laugh this long or this hard in a very long time. The work opens with a deskbound Gavin Webber, playing with those corporate fidget toys – you know, the prototypes of the ones we now give to kids with ADHD? He’s nervously awaiting the arrival of young upstart, Joshua Thomson. Thomson is the new guard, the successor of the empire Webber built and Webber is none too keen on giving up the swivel chair. What ensues is an epic battle of the male ego – youth vs age; strength vs wit; innovation vs experience. Utilising all the accoutrements of your bog standard office, Webber attempts to intimidate and overshadow his nemesis. Filing cabinets are ravaged, chairs are thrown, desks are repurposed as dancing platforms. There are reams of paper, flung aloft or folded deftly into airborne missiles – one particularly memorable scene sees Thomson catch such a missile neatly in his mouth. Webber congratulates him with that most masculine of accolades – the hearty handshake, which steadily metamorphosises into a full-body, limb-swinging assault. In another phrase, Thomson finds himself atop the filing cabinet. The next thing we know the two men are whooping around the office, knuckles dragging, chests beating. For a dance work tackling male ego and power, this is perhaps an obvious choice, but the beauty is – I never saw it coming. In a similar twist, the chairs the men are fighting with become antlers as the two bucks battle it out. Again, not surprising but somehow gleefully unanticipated. It’s impossible to stop watching the charismatic Webber. Now silver-haired, he still has the grace of someone half his age and watchability that must be the envy of any dancer in the country. Thomson is a wonderful foil and with his (dare I say it?) youthful vigour, the better dancer. Together, whether they’re discussing the migration patterns of the Sooty Shearwater or hurling each other through the air, their chemistry bristles. This is slapstick on the desktop. The gags – and the laughs – are relentless. By the time it was over, it was almost unclear what we had witnessed – was it dance, theatre or comedy? No matter – whatever it was, it was marvellous. Ambitiously physical: Marlo Benjamin & Alexander Perrozzi in Kynan Hughes’s ‘Love/Less’. Photo: Emma Fishwick. 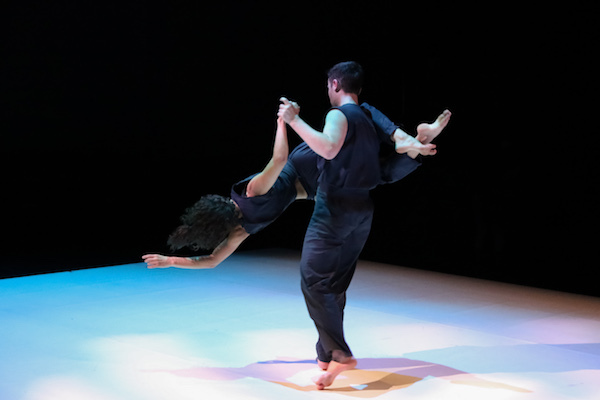 Independent local choreographer Kynan Hughes and that invaluable hub of contemporary dance in WA – STRUT dance – have produced a showcase of fine offerings as part of the MoveMe Festival. The program includes a full-length piece, produced and choreographed by Hughes, alongside two short works presented by STRUT (performed on alternate nights) – #thatwomanjulia by Natalie Allen and Sally Richardson and the one I saw, Blushed by Yilin Kong. The latter is an unashamedly sensual exploration of femininity performed by Kong in three sections. Kong’s movement is exquisite and the 20-minute work, while erring on the side of repetitive, is beautiful to watch. Love/Less is the second full-length work from local choreographer Kynan Hughes. While the first, 2017’s Valentine, received mixed reviews, this new offering demonstrates that Hughes is coming into his own. Inspired by the death of Hughes’ father, Love/Less has actually been in development for five years. In the program notes, the choreography is credited as a joint effort between Hughes and his dancers – Rachel Arianne Ogle, Marlo Benjamin and Alexander Perrozzi. It’s an ambitiously physical work, demanding great athleticism of the performers, all of whom rise admirably to the task. While there is not a strong narrative thread, the work’s movement and its flawless execution by the dancers easily holds the audience’s interest. Ogle is always extraordinary to watch and she is in peak form here. I’m sure she doesn’t mean to do it, but her onstage magnetism is so strong at times it tends to overshadow anyone performing alongside her. That was not the case on this occasion – when Benjamin (who I had not had the pleasure of seeing before) started in on her solo, I was gobsmacked. Like some sort of hypermobile elf, Benjamin’s control of her vessel is so impressive, her economy of movement so incredible, I could have watched her all day. Aided by an evocative soundtrack by Sascha Budimski and gorgeous lighting from Joe Lui, Love/Less is a truly remarkable feat of dance. Dance for dance’s sake, if you will. 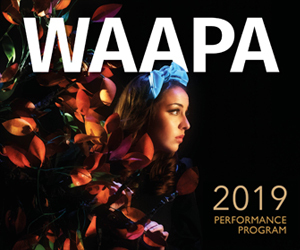 You can catch both these programs at the State Theatre Centre of WA until September 22. Pictured top: Hilarious absurdity, wrapped in dance: Gavin Webber and Joshua Thomson in ‘Cockfight’. Photo: Darcy Grant. Rachel Arianne Ogle is extraordinary to watch. Photo: Emma Fishwick.